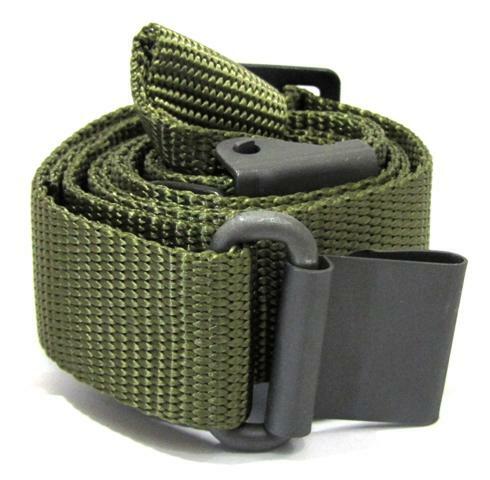 Marines, Cadets, ROTC, replace your worn-out small arms sling with a new original 1-1/4'' nylon model! This was for many years, the standard rifle sling, starting with the M1, M14, M16, M4 and other sling swivel equipped weapons. Features the metal clip-on hook attachment used on the AR15 / M16 / M1 / M14 since the Vietnam War. Fits most assault rifles. Preferred by many Infantrymen. The Olive model is focused on the M14 and M1 series, but also fits the M16, AR15 and M4 Series. Use: To mount the sling on the rifle, take the hook end and attach to the sling swivel on back end of gun stock. Open sling keeper (clamp) and pull the sling out straight and feed through the front sling swivel on gun, then re-slide the sling back through the sling keeper (clamp) and lock down. This is also how the sling is adjusted for length. Best sling if you're familiar with making a shooters sling or hasty sling to help steady the weapon. Completes the AR platform and is fully functional for carrying the weapon either shouldered or across your back. 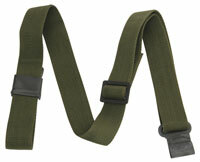 I love this basic military sling. Looks GREAT on my retro build m16a1. Well made, should function well for years to come.